Replace half the basil used in this recipe with mint leaves, if you like; this is a summery affair, intended to coincide with the latter part of asparagus season when the spears are plentiful & cheap. Use any almonds you have in the pesto: flaked, blanched, chopped or whole with skins all work well. Never drain the pasta too thoroughly, as the starch cooking water helps to form a sauce. Trim the very ends from each asparagus spear, only removing more if they are woody. Cut off the tips with about a thumb’s length of stalk. Set aside. Bring a medium saucepan of water to the boil, add the trimmed asparagus stalks (not the tips) with a good seasoning of salt & boil for 5 mins, or until tender. Scoop the stalks out & into a colander with a slotted spoon, leaving the water behind in the pan. Give the stalks a brief rinse under cool water, just to take their temperature down a little, & tip into the bowl of a food processor. Return the pan of asparagus water to the heat, topping it up of needed. Bring to the boil & add the pasta, cooking according to the packet instructions, or until al dente. Set a griddle pan over a high heat until smoking, toss the asparagus tips with a little regular olive oil to coat lightly & griddle for 4 mins, turning now & then, until coloured & soft. Set aside in the pan. Put the garlic, almonds, almost all the basil (reserving a few leaves to serve), a squeeze of lemon juice & the extra virgin olive oil into the food processor with the asparagus stalks & blitz to a rough purée, stopping to scrape down the sides a couple of times. Stir in the lemon zest & cheese. Taste & season, stirring in more lemon juice, if you like. Drain the pasta – not too well - & return to the hot pan with the beans & asparagus pesto. Warm through very gently, then divide between warmed bowls or plates with the griddled asparagus tips, the reserved basil leaves & more cheese. from Tom Kerridge's Fresh Start – How to cook amazing food at home (Bloomsbury) photography © Cristian Barnett. Preheat the oven to 220C/200CFan/Gas 7. Heat the olive oil in a large ovenproof frying pan over a medium-low heat. Add the diced potatoes with a pinch of salt and cook for 8–10 minutes. Toss in the red onion and cook for a further 5 minutes. Meanwhile, crack the eggs into a large bowl. Add the cream, nutmeg, chopped mint and some salt and pepper and whisk well. Set aside. Add the garlic to the pan and cook for 2 minutes, then toss in the spinach and sauté until it begins to wilt. Pour the cream mixture into the pan, stir around for one minute, then remove from the heat. 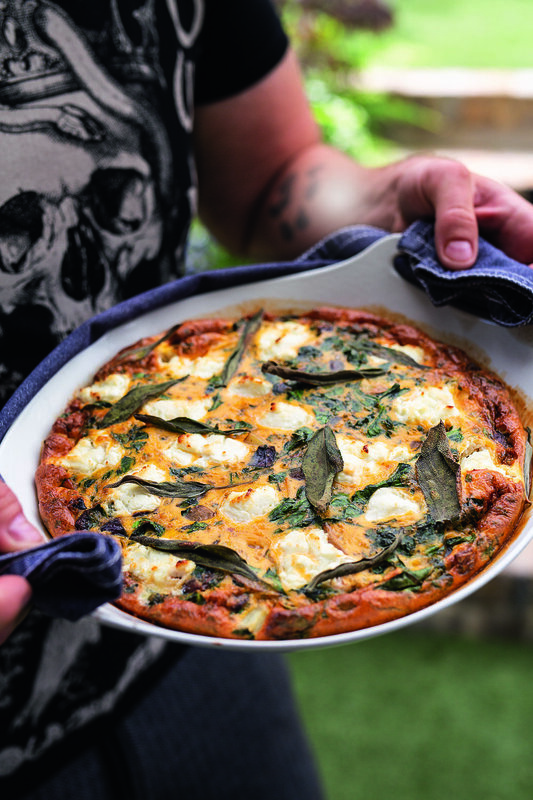 Dot the goats’ cheese evenly over the surface of the frittata and scatter over the sage leaves. Place on the top shelf of the oven for 8–10 minutes until the egg has set and the cheese is golden. Remove the frittata from the oven and leave to stand for a few minutes to cool slightly before serving. Tip: This veggie frittata uses a classic combination of flavours, but feel free to vary the ingredients using whatever is in your fridge – diced cooked peppers, onion, peas or mushrooms, crumbled feta or sliced spring onions, for example. Put the butter beans into a large pan with lots of water, bring to the boil & simmer for 1hr or until tender. Drain & set aside. (Alternatively if using tinned butter beans, drain & set aside). Cut the chorizo sausages into thin slices. Put the olive oil & garlic into a pan & heat over a medium-high heat until the garlic begins to sizzle. Add the chorizo & cook until the slices are lightly browned on either side, then add the onion & continue to cook until it has softened. Add the red wine & cook until it has reduced to almost nothing. Add the canned chopped tomatoes, thyme, butter beans & half a tsp of salt & simmer for 15mins. Scatter over the parsley, spoon the stew into deep, warmed bowls & serve with some crusty fresh bread. As a vegan alternative Nigel used Wheaty Seitan Vegan Sausage Chorizo. New potatoes, a delicate sauce & the freshness of British asparagus make this a truly special dish. Make sure that the sauce is well seasoned & has enough acidity to cut through the buttery potatoes. The herbs are really a matter of personal choice but I like the onion note of chives & the fresh punch of flat-leaf parsley. Brill is perhaps considered inferior to turbot but it cooks in a very similar way & has a lovely delicate texture. Price-wise it is usually a cheaper option than turbot too. Bigger fish will fetch a premium but it is worth a few extra pounds to get a fish that yields thicker fillets. I always choose a bigger fish & freeze any that I don’t need for another day. One trick you can use on the smaller fillets is to fold the thinner, tail end under to create a portion that is a more even thickness. As the proteins set during cooking, the folded piece will stick to the top piece. 1. Cook the potatoes in boiling salted water until tender. Drain & add 25g unsalted butter. Crush the potatoes with a fork, trying not to work to a mash. Adjust the seasoning & add more butter if a little dry. Keep warm. 2. In a small pan, reduce the vermouth & white wine to a syrup. Add the stock & reduce to approximately 50ml. Remove from the heat & gradually whisk in enough cold unsalted butter to thicken slightly. You want to keep moving the pan off & on the heat, enough to allow the butter to melt into the sauce but not enough to boil it. Adjust the seasoning with salt & lemon juice. Rich & tangy is the result you are looking for. 3. Cook the asparagus in boiling salted water until just tender, drain & add a knob of butter. Keep warm. 4. In one large – or two medium – heavy, non-stick frying pans, heat a couple of tablespoons of olive oil. Season the flesh side of the brill fillets, dust lightly with flour & shake off any excess. Lay the fillets gently into the pan, flour side down. Cook until golden brown on the flesh side, then season the skin side & add approximately 20g unsalted butter to the pan(s). Baste the fish with the foaming butter, then turn over & cook through. Test by pushing a cocktail stick into the fillet; when it is under-cooked you will feel the fibres tearing as you push the stick in, once done it will slide in smoothly. Remove from the pan immediately & drain on some kitchen paper. 5. Warm the sauce & add the herbs. 6. To serve, mound the potato into the centre of four shallow bowls, place the fish on top of the potato & strew the asparagus spears around. Spoon the sauce around the fish. Slice & wash all the vegetables & place in a large pan. Add the parsley, fennel seeds & star anise. Just cover with water, bring to a boil & then simmer for 30 mins. Store with the vegetables in until required, but not if freezing. ﻿We all yearn for fresh food. And there’s nothing quite so vigorous, appealing & tasty as freshly harvested spring vegetables & salads. What is so wonderful about sprouting your own vegetable seeds & pulses for salads is that you can enjoy this spring-like energy all year round. Sprouted peas provide amino acids, fibre, minerals & carbohydrates, as well as vitamins A & C. Purple & white sprouting broccoli is also wonderfully nutritious, & being hardy, will survive frosts & snow. It is particularly welcome in the late winter/early spring, between Brussels sprouts & first spring cabbage. 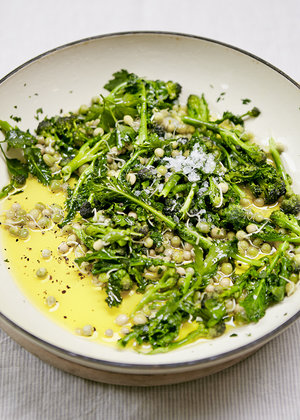 Choose very fresh, short & tender stemmed sprouting broccoli, or discard ruthlessly the fatter, woody stems. Melt/heat your favourite fat in a wok or frying pan over a medium heat. I prefer a slightly caramelised ghee as this adds a subtle nutty flavour. Throw in your sprouting broccoli & sauté quickly, tossing & turning; after a few minutes add the peas. Continue to toss & turn lightly for a minute or two. Pour over any remaining fat & mix the parsley into the salad. Season as you see fit. Serve warm or at room temperature. Sauté some bacon& lightly cook your sprouted peas in its fat. Stir-frysome coarsely chopped mushrooms, especially chanterelles – add some roughly chopped garlic, before adding your sprouted peas. Garnish with coarsely chopped parsley. Fry the sprouted peason their own in butter, just for a few moments, add a sprinkle of flaked sea salt & coarsely ground black pepper, & enjoy wiping out the bowl with a slice of sourdough bread. Note from Nigel: I crumbled over some Greek Feta cheese & served alongside it, Binary Botanical, a 4% bevvie brewed with organic hop leaves in Billinghurst, West Sussex, which tastes like an intriguing dry Prosecco. The non-alcoholic drink is also brewed from hops (Amarillo & Cascade), but only to 0.5% abv, by the talented team at Thornbridge brewery in Bakewell, Derbyshire.